National Center for Emerging and Zoonotic Infectious Diseases (U.S.)	. National Center for Immunization and Respiratory Diseases (U.S.)	. Measles spreads easily and can cause serious illness. If you get a fever and a rash in the next three weeks, call a doctor. Tell the doctor that you traveled. National Center for Emerging and Zoonotic Infectious Diseases (U.S.). National Center for Immunization and Respiratory Diseases (U.S.). Measles spreads easily and can cause serious illness. : Get vaccinated to prevent measles. 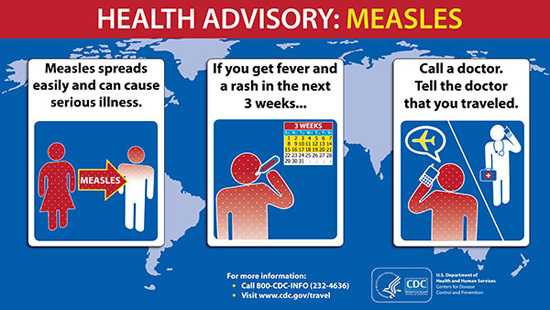 : Protect yourself from measles.